The famed Sapporo miso ramen is now mass produced, packaged and enjoyed! Inspired by the ramen chefs of Northern Japan, I stir fried noodles in miso, garlic, ginger, soy sauce and sake wine. Soup was not added. If you are familiar with Japanese cuisine, you’d be quite correct to compare my ramen stir fry to yakisoba. Although yakisoba is made with Chinese egg noodles and usually fried in oil on a greasy iron top. Ramen on the other hand are made mostly with wheat noodles. In addition, my ramen stir fry sizzles with kisses of high quality butter and miso. Ramen Stir Fry offers a melody of buttery noodles with a smooth undertone of miso. Savory fans of garlic and salt should use the higher measurements of soy sauce and garlic. In Japan, it’s a compliment to the chef to slurp noodles. 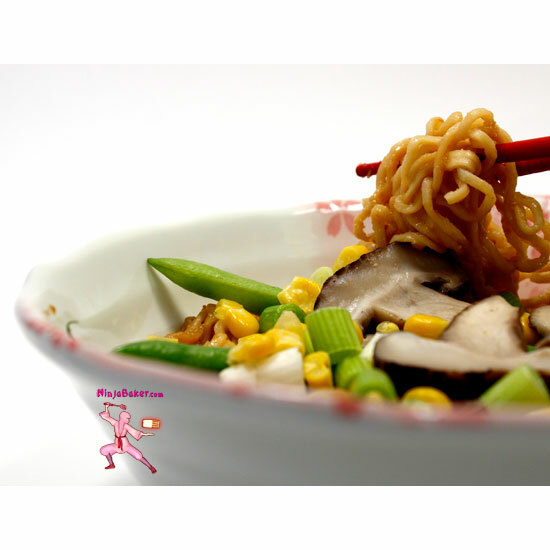 So, if you catch your family or friends slurping the ramen stir fry, you know you are a ramen noodle maestro! Parboil (lightly boil) green beans and mushrooms. Drain. Boil ramen noodles (without the package soup) for 3 to 5 minutes. Stir in 1½ tablespoons of butter. Drain. Set aside. Melt 1½ tablespoons of butter in a wok or deep large saucepan over low-medium heat. Swirl in miso, garlic and ginger. Pour in soy sauce and sake. Stir vigorously. Make sure all miso bits are dissolved. Add the noodles to the wok mixture, making sure all the noodles are coated with the miso mixture. Gently slide then ramen into a bowl. Garnish with the green beans, mushrooms, corn and scallions. Tip: Add extra-firm tofu for a protein packed garnish. Today's #SundaySupper chat at Twitter is all about meatless meals. Tammi, the talented mommy and magical MommasMeals maker will host. (Love to have you join us! Please scroll down for info.) My meatless ramen stir fry was inspired by the Japanese ramen chefs of Hokkaido. Here are a few more inspired recipes. Wishing you priceless experiences which bring on the smiles!